Jose Gonzalez was in dire need of a practical workspace. Anyone looking for a workspace that supplies an array of services to help relieve the stress of start-ups, should inquire about Regus, Gonzalez stated. “You don’t have to worry about anything. 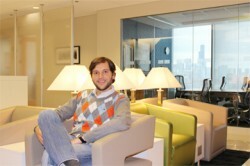 This is one of the best offices I have seen here, by far.” If you would like to learn more about Regus, visit www.regus.com. Or call, 1-800-633-4237.